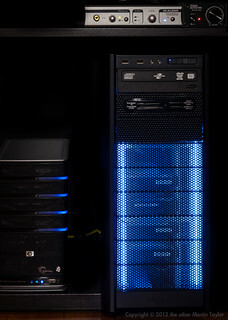 The last time I modded a PC case blue LEDs were new and expensive; rounded cables were hard to come by so we razor'ed and wrapped our own; the default PC case color was still beige; and a PC over 1gig was screaming. 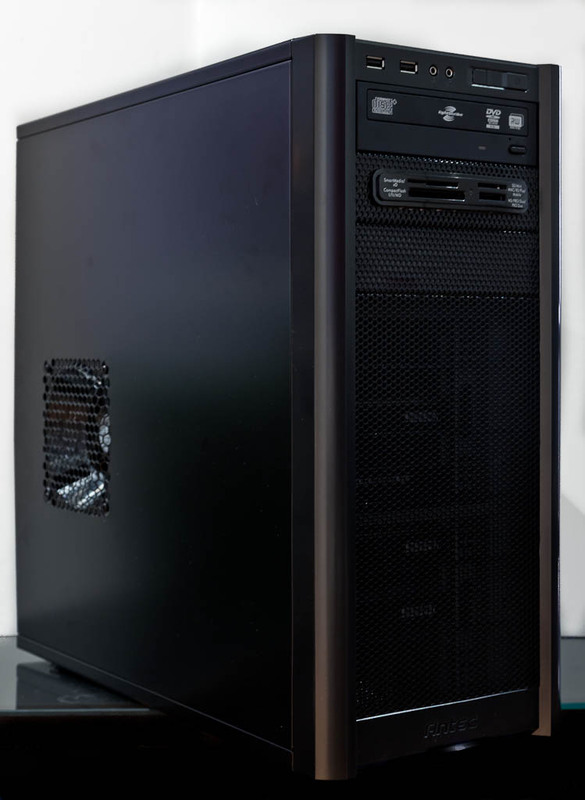 Then it became more expensive to build you own PC than it was to buy something with a guarantee and an OS from Dell or HP and cutting windows in the side of cases to show off the internal components seemed too geeky even for me. So I buy my PC's off the shelf these days and then add components and upgrades as required. My current home desktop is a HP Pavilion m8407c. It's a couple of years old but its Core 2 Quad processor is still man enough for Lightroom, Sketchup and Sony Vegas which are the most heavy duty programs it has to deal with. I also might be the only person on earth still happy with Vista 64. As usual, I have had to add components to keep my machine current: 8 gigs of memory with heat pipes pre-fitted caused an issue as the hard drive cage would no longer fit in position with a drive in place. The case was holding more hard drives than it was designed for and I needed to add another one - drives were just balanced in place as there were no more spaces to fit them properly. A chunky video card and new power supply were taking up much more space than the OEM components. Finally I had to admit that I'd outgrown the OEM HP case and so, unexpectedly, I found myself in the market for a new PC case for the first time in years. Things have moved on a lot in the intervening time since I was overclocking my Celeron 233. I don't think you could buy a beige case even if you wanted one and 80mm case fans are reserved for the most frugal of cases. That said, I didn't want to spend a fortune on a new case that spends its time hidden under my desk. I wanted something with plenty of space for expansion without being monolithic. I wanted something quiet and understated. Surprisingly, I was spoiled for choice but I after reading a few reviews I plumbed for the Antec 300 for $60 delivered from Amazon. 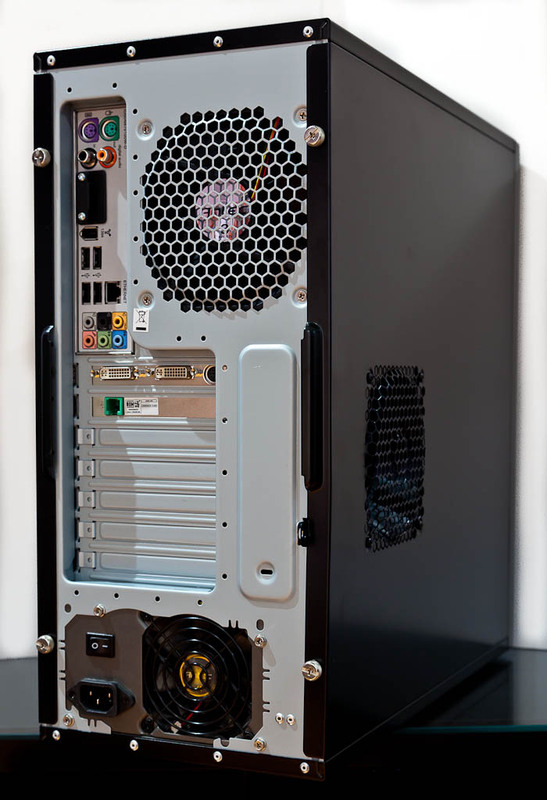 The 300 is much bigger than the OEM HP case but is still considered a mid or mini-tower. It's exterior is an elegant black and its front is a stylish perforated metal. Behind the front is a removable, washable filter and, although the case does not come with a power supply, it comes with a top mounted 140mm fan and a rear mounted 120mm fan. The side panel will also take a 120mm fan and the front will take two more fans. That's a lot of cooling; way more than I needed and I wanted the case to be quiet not sound like a spooling jet engine in a wind tunnel. I turned the two included fans down to their minimum settings relying on negative case pressure (air gets sucked in to the case by the air being forced out of the rear) to keep everything quietly cool. The interior is plain galvanized steel and many people of the interwebs seem to paint it black for better heat conduction they claim, though really it's because it looks cooler but who's going to be looking in there except me when I need to swap a drive out? Way too much effort for such little payback. I wasn't even going to fit a fan to that side panel but I couldn't find a way to turn off the 3-wire case fan monitor in the HP bios so, to avoid a system nag on every boot, I installed the little case fan from the original HP case to the side via a fan adapter and a 3 wire cable extender. It is definitely not needed to keep the components within working temperatures and shame on HP for not making this fan's settings accessible in the Bios. Apart from that little issue rehousing the HP internals into the Antec was relatively easy. There is so much more room to get your hands into the case when you're installing everything than in the compact HP case. The power supply fits on the floor of the case, well out of the way of the motherboard just make sure your power supply's cables are generous enough to be that far removed. I was using an Antec power supply I'd already bought to power a beefier graphics card so it wasn't a problem for me but the OEM HP power supply might be a different matter. I did not have to remove the CPU or memory from the board before transferring it into the Antec which came with plenty on standoffs to get the motherboard properly seated. 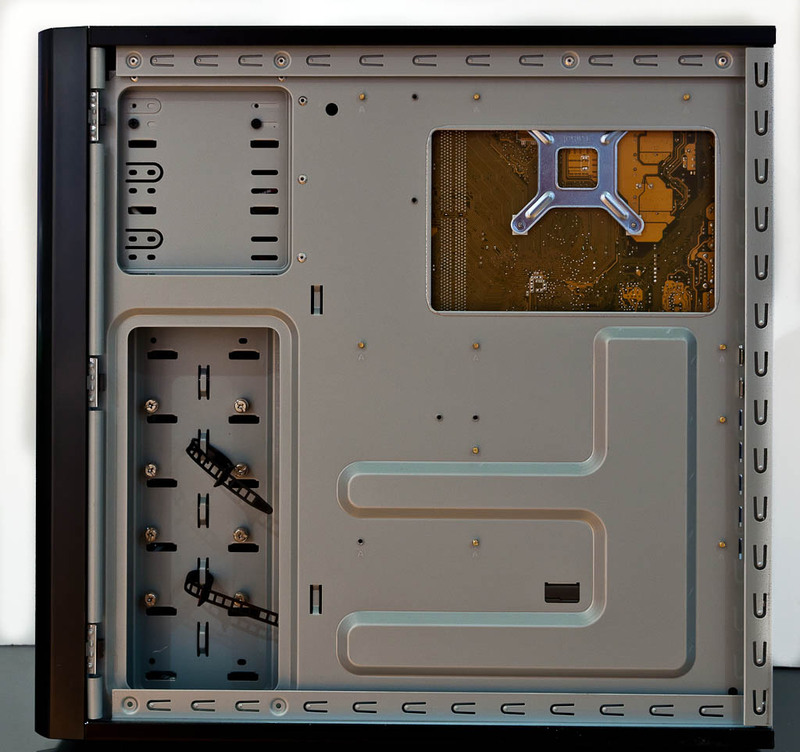 The rear panel from the HP surrounding the motherboard ports removes from the HP case and fits in the Antec to give a professional finish. There is plenty of room to route the cables tidily and out of the way of the main components. The only fiddly part of the installation is fitting the front panel lights and switches to the motherboard. If I were to do this again I would connect those wires before I screwed the motherboard into the case: the writing on the motherboard is too tiny for these old eyes and my fingers aren't dexterous enough to easily plug those micro connectors onto the pins of the motherboard. Luckily I got them in the right place first time and did not have to revisit that part of the installation. The front USB connectors were a much simpler affair. obviously, I don't know how to utilize that. Antec supply a bunch of thumbscrews with the case which are great for mounting the hard drives in a tool-less fashion. There's room for 6 standard 3.25" drives with ample air flow around them. There's also room for 3 optical drives and even 1 laptop sized hard drive on the floor though I've yet to work out why I'd put a laptop hard drive in this case. Although there is no built in method for isolating the drives from the chassis to reduce sound everything is so solid that HD noise is minimal - certainly better than the OEM case. The Antec doesn't come with a card reader and the HP's is not a standard fitting. I could have bought a new card reader for not much money but I was trying to change as little as possible from the old configuration as I knew that worked. So it was out with the Dremel like an old-school modder to adapt a standard front panel blanking plate to take the OEM card reader. It's not the slickest job you've seen but it works. The only flamboyant touch I added was to light the front panel with a couple of blue neon tubes (cost $12). I leave them off 97% of the time only turning them on when people come over and visit the man cave. I guess I'm not as grown up as I like to think. Conclusion: for $60 the Antec 300 is a solidly built and quiet case with lots of cooling and expansion potential. If you're in the market for a classy looking computer case it is hard to beat. 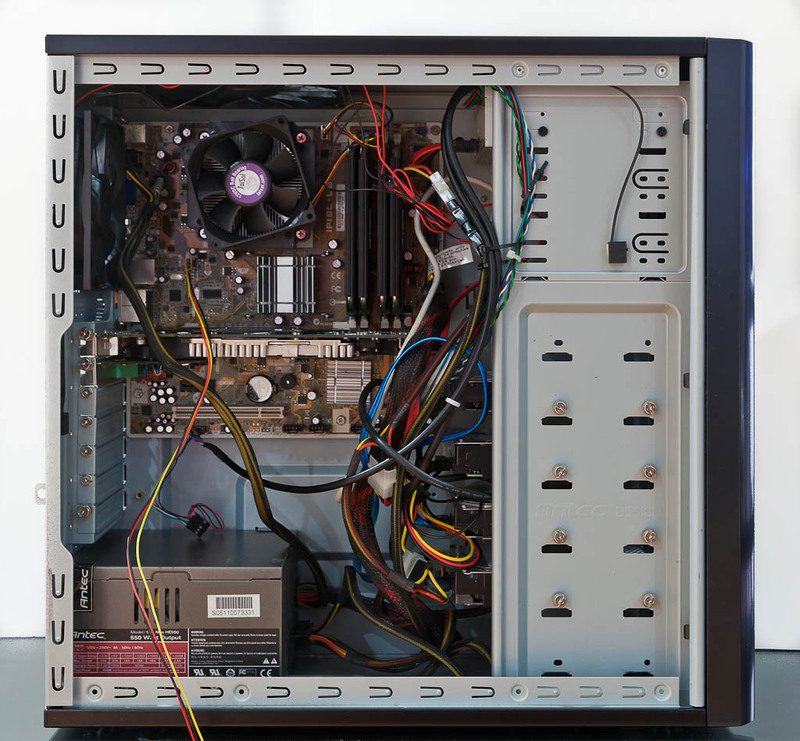 If, like me, you're looking to rehouse a computer that has outgrown its OEM case it's a great choice but it would be equally competent if you were building a machine from scratch. After all this time of buying off the shelf PCs this case may inspire me to building my own again. It demonstrates the difference in quality between OEM and specialist components really well. Highly recommended. Love this case as well. Also don't know how to utilize that little cable organizer. Glad to know I'm not alone. I have an extra Three Hundred 5.25" to 3.25" adapter, NEW in the box, with faceplate. Free to good home, if you will send me a USPS or UPS mailing label. If you still have it, would love to place a USB 3.0 box that came with my MB. They would work great together. You can confirm via email at climbhigh30@gmail.com. If so will get you a UPS label out tomorrow. Yeah Mine looks like a mess too, But there is not much you can do, unless you have a super expensive PSU with long cables. But my Corsair CX600 only has average sized cables. But for some reason the airflow still stays good.